Helpers. 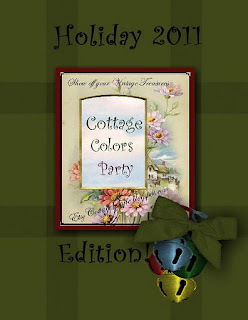 This week is time for the Holiday Edition of the Cottage Colors Party. heirlooms.......creations for everyday or the holidays......If it's red or green or a combo of both show it off! Yes friends it's the first Monday of December and it's Market Monday! What more perfect spot to find that special one of a kind gift than here at our virtual flea market. 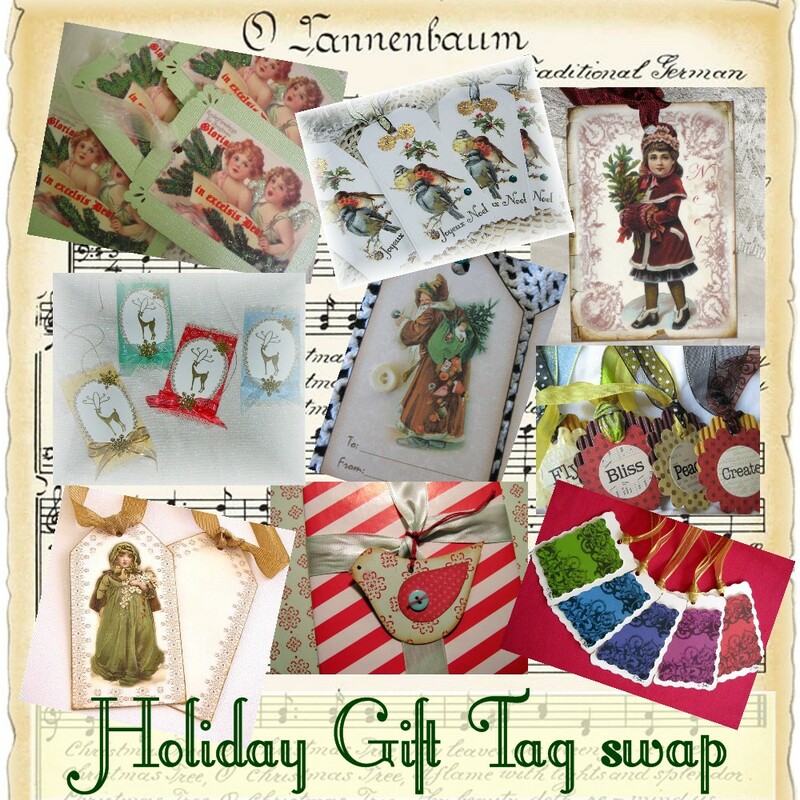 Everything from vintage finds to handmade designs in fiber art, fine art, mixed media.......jewelry....,,home decor.......holiday decorations.....and so much more. If you are new to the site, or returning once again just scroll down and visit all the very wonderful vendors listed and begin shopping. Home again home again market is late. To market To market it's open all week! Home again home again with a full cart. The monthly virtual flea market is filled with vintage finds, one-of-a-kind artworks, home decor pieces, crafts, supplies, vintage finds, and more. We hope as you browse you find all kinds of goodies and something you just can't live without! Be sure to let the vendor you were there, they love to here from those who visit and we here at Etsy Cottage Style would love for you to leave a comment at the bottom of the post letting us know how we're doing or just to say Hello. The Market is open all week, Vendors set up their virtual spots throughout the week and items are added, sometimes daily, so things change every day. Today Begins the week long Color of the Month party here at ECS Blogsapot for the Month of June. When you think of June you think of weddings.......roses......so, the color associated with June is WHITE. That's right. Let's see your white collections of Ironstone, or pics of your wedding. How about that gorgeous white rose blooming in the garden. 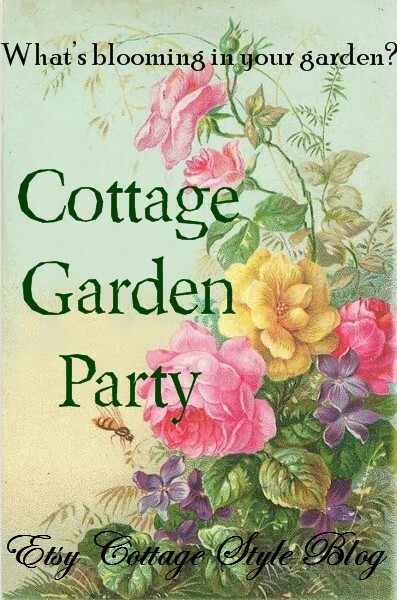 Well your cottage garden filled with white larkspur, candytuft, shasta daisies, and coralbelles would be perfect. Are you working on a creation or design that is all shades of white! Or, do do white in you decor? We'd love to see it! It's May 1st. 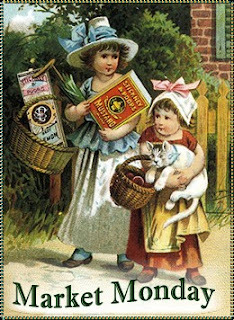 That means May 2nd is the first Monday of the month and it's Mother's Day Week.So, let's all get ready, go to Market, and check out all the wonderful creations, craft supplies, and vintage finds for Mom. While you're there we're sure there will be something for yourself you just can't live without! How about showin you collection of Jadite, or dicontinued pattern of 70's Corelle. Of course there is the Easter grass springin up all over in fields and yards. Maybe you have a painting of a Springy landscape? There is always enough time to show off those St Patrick decor you haven't put away yet, or maybe, you've been working on a green creation. Whatever it is...we'd love to see it. Monday, tomorrow, kicks off the Cottage Colors Party and runs all week so come it's your, or really our lucky week!! The Linky is up and running. It's easy to use. 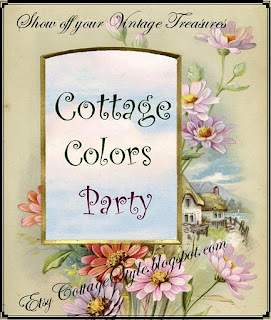 After you have "published" your Cottage Color post on your blog, stop by Etsy Cottage Style and put your name and the permalink to your post into the Linky sign up box. Grab your camera's and head out to snap a few photos of your garden in bloom for spring! 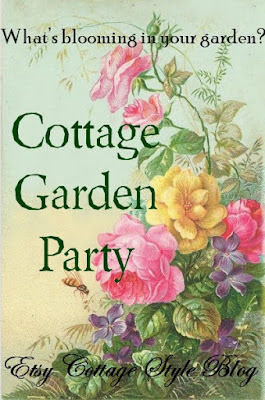 This blog party is the first of three seasonal Cottage Garden parties we will have that gives all of us a chance to show the changing beauty of our gardens. Flowers make us feel good and what better time to share the awakening of spring! We will be having a party for each season. The summer party will start the first day of summer in June and the fall party will be the first day of fall in September. 3. Linking will be open until May 30th, so you have lots of time, if you are like me here in Oregon, not too much is blooming yet! Okay..let's go shopping ;) and can you believe this virtual flea market is open all week! If you'd like to join us as a vendor with a Selling Blog, Website, Etsy or Ebay site, visitors to the blog will be directed to participating sites with the help of InLinkz. Now, remember you can show off anything in your blog post......Let's see those those purple platform disco shoes...that vintage violet topped hat.....those costume jewelry amethyst brooch and earring set would be perfect.........and you can't forget that vintage inspired creation from that old fabric or ephemera! Come on Show us your color purple!!!! 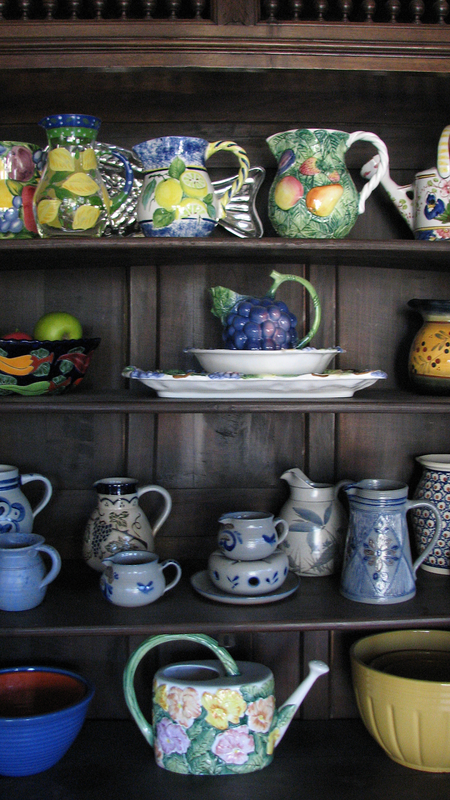 What's In Your Cottage Cupboard? We at Etsy Cottage Style want to see what's in your cabinets....so, if you have a cottage collection on a shelf or behind wood, glass, or anything else, please show us!! Link with me and lets see what you are hiding. Now is the time to bring it all out. Here is your chance to show off what collections you have in your cupboards, so please open your doors, link up with us and lets have some fun. It's the 1st Monday of the Month! Our favorite virtual flea market. 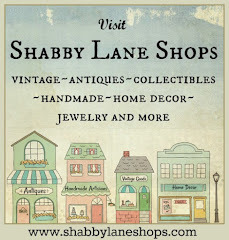 hand-made, keepsakes, and collectibles in Vintage, Shabby Chic, Country, Antique. Kitchy, Cottage, motifs. The best thing is we're open all weel 24/7!!! It's time for a new party! Here we go, a brand new blogging get-together for 2011! This should prove to be a colorful Party. The 4th week of each month, beginning on Mondays, will be open to all bloggers showcasing creations they are working/worked on or collection of vintage finds that fit into a color catagory. When you think of the color blue, do you think of a robin's egg? An azure blue sea, a clear blue sky, or the icy blues of a wintery landscape? Well, let's see your true blue examples. Flow Blue China, Pyrex, Sapphire Jewelry, Blue Chintz Pillows, Blue Boy Print.........as always you all have some great ideas of your own. 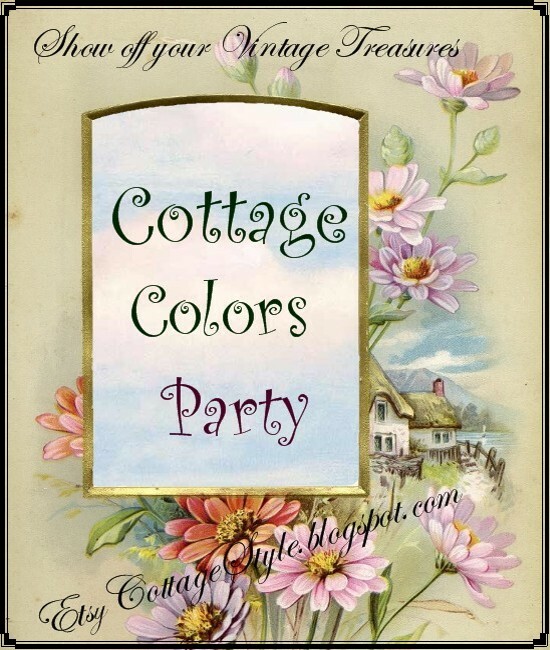 The new Cottage Colors Party! Okay everyone get ready for a new monthly Blog party! Each month has a color associated with it just like a birthstone or flower,so inspired by the possibilities, we thought it'd be fun to have a party where we showoff our vintage finds or creations in monthly color catagories. This Monday will kick off the blog get-together and every 4th Monday of each month thereafter. January's Color of the Month is Blue so as usual get your photos out and get ready to post your favorite blues. 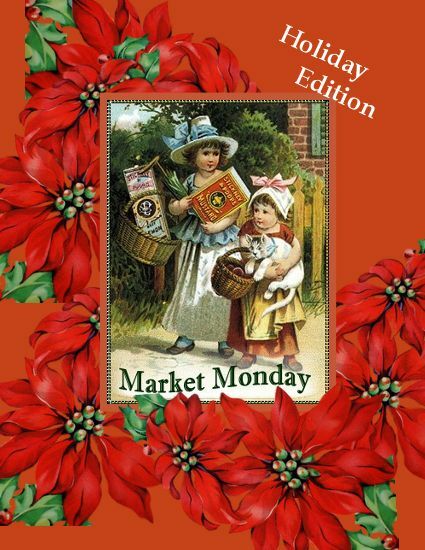 Welcome to the first Market Monday of the new year! This is a forum where participants come to introduce themselves through thier online selling sights. If you have an Etsy. Ebay, selling blog, or traditional website, you're invited to join in. ﻿Our virtual flea market showcases.......... vintage and new jewelry, kitchy and dime store finds, prims, vintage textile designs, hand-painted home accents, dolls, supplies, paper creations, fabrics, antiques, and smalls. It runs through the whole week!